We are very thankful to LV Painting for sharing their expertise on painting and answering some questions that may help our viewers in their next painting project. 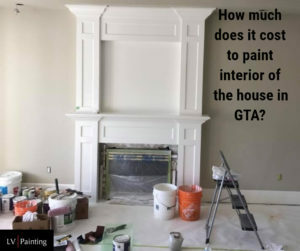 How much does it cost to paint interior of the house in GTA? The average cost to paint interior of the house with approx. 2000 sq ft area is about $4000 to $5000. This price in general shall include walls, ceilings, trims, doors, crown mouldings and almost everything that is considered as interior of the house for painting. You can find out a budget price if you know the square foot of your house. You need to include walls and ceilings. For a rough idea it is better not to deduct any openings of windows and doors unless they are too big of a size let’s say 30- 50% of the wall area. The average sq ft prices applies to rooms with regular ceiling height which is 8 to 10 ft. If your ceiling height is more, the painter will need more preparation in terms of scaffold/ ladders etc. and some more time which may increase your cost. 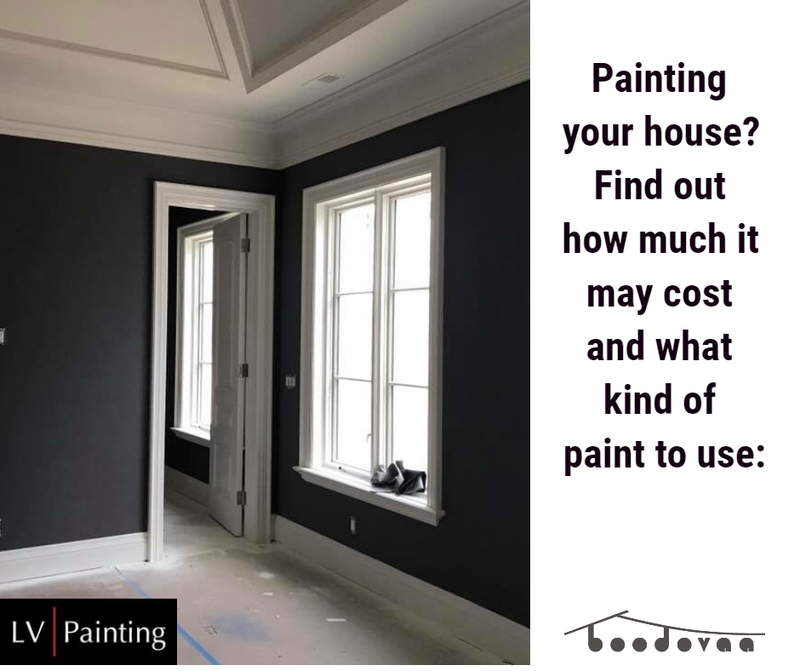 The average cost for painting is around $2 to $ 3 per sq ft. Prices go down depending upon quantities, paint selection and preparation required. Higher the sq ft, lower the price. Painting a door with frame may cost around $70 to $80. Baseboard or trims may cost in a range of $1.50 – $ 2 per linear ft.
Painting walls higher than 10ft may cost you about 25% more per 2 ft height increase on an average. Painting cost of staircase may vary depending upon the complexity involved. For a budgetary idea, most standard staircase inside your house may range between $500 to $1100. How much does it cost to paint exterior of the house and how it is different than interior painting? The average cost per sq ft is almost like interior painting cost which is $2 – $ 3 per sq ft but there are lots of other factors that affect the exterior painting and increase the cost. One of the biggest factors is height, even a single storey house may have elements reaching to 16- 18ft height or more. Working at heights in exterior involves lots of responsibilities and so you should ensure that the person you hired for painting is licensed professional for this work. If you have an older house, it may require lot of preparation work as weathering effects on exterior surface are totally different than interiors. Drastic change in selected color or shade as compared to the one you have may also require lot of work. Any obstacles to reach different elements of your house like trees, canopies etc. 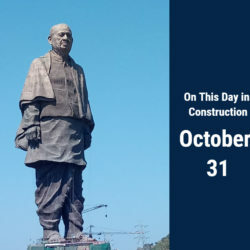 may also increase the cost. What kind of paint to use for interior and exterior of the house? Paint companies spent millions of dollars for years in R & D to develop the modern era paints and that’s why they call it “paint technology”. Starting from the type of surface to micro climate of each room, lots of factors affect the type of paint to be used. You can find specific paint for different applications like bathroom, kitchen, drywall, ceiling, doors and frames, trims and variety of paints for exterior applications. There are two categories based on composition of paint, Oil Based or Water Based (Latex/ Acrylic). Oil based is old technology and water based is new technology. It is also not that simple difference as oil-based paints are still very good in certain applications and difficult to be replaced by latest ones till date. Before we go further, we must acknowledge that ready mix paint (tin packing) was invention of Sherwin Williams in 1866. Until the year 1866, paint was made on site with different raw materials and then applied immediately and there was no technology to store the extra material! The synthetic paint (with Acrylic) was first invented by Leonard Bocour and Sam Golden in 1940s. World War II brought lots of changes to paint industry by increasing demand of paint and creating shortage of linseed oil (a common paint binder). Water based paints (Acrylic/ Latex) are made up of pigment and binder with water as a carrier. Oil based paints are made up of pigment and resin dissolved in a solvent, the solvent evaporates and leaves behind the resin to harden and pigment for color. The major reason why latex paint (water-based paint) is more popular now a days is the use of water instead of solvent. Oil based paints use solvent which means higher content of VOCs. VOC means Volatile Organic Compound which creates bad odor as well harm our body if inhaled in higher contents. VOCs can cause acute symptoms including headaches, dizziness and irritation. Some VOCs are suspected carcinogens too! Oil based paints have some advantages like durability, toughness and nicer finish. Oil based paints can withstand weathering effects better than water-based paints and so they are used in most exterior applications. Oil based paints take longer to dry. Latex paint/ water-based paint on the other hand dries faster and creates low VOCs and less odor. Obviously, in the present time when time is money and money loves speed – latex paints are the first choice due to easier and faster application!! 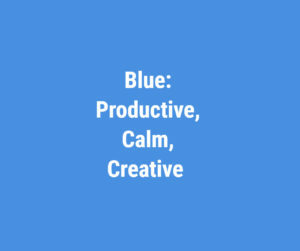 Color is the biggest component of our environment. It has a direct impact on our mood. 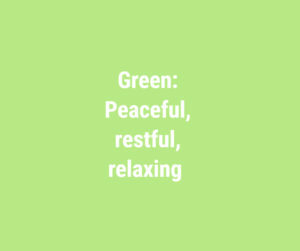 Each room in your house has its own environment and so color selection is a very important task. 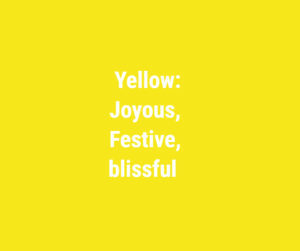 Brighter colors make the room look bigger and darker colors do the opposite. Painting baseboards and mouldings with a lighter color than the walls will make the room look even bigger. 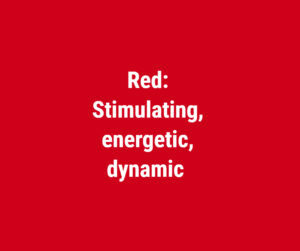 Every color has a distinct effect on your mood. 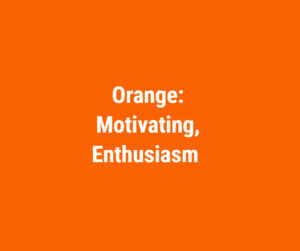 Painting walls with a light green color will give you peace of mind and painting your exercise room/ gym with an orange color will give you more energy and enthusiasm. Sheen is the glossiness of the paint finish. Higher the shine means higher the durability. From glossiness point of view, from high to low gloss, paint could be high gloss/ glossy, semi gloss, satin, egg shell and flat. Higher the sheen, higher the shine, higher durability but lower in ability to hide wall surface imperfections. 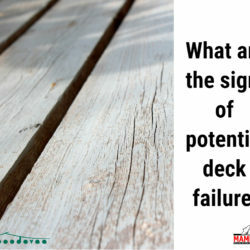 Most common selection is eggshell or flat because it will hide most imperfection on surface. Also, the eggshell or flat is more economical as it will give you more coverage per gallon. The eggshell and flat finish paint has more pigments to give more coverage. The glossy paint has more resin or binders which gives more shine but little less coverage. The shiny paints give durability and can be cleaned easily and that is why they are the best choice for high traffic areas like kitchen or kids’ rooms. The high sheen paints can resist stains better. 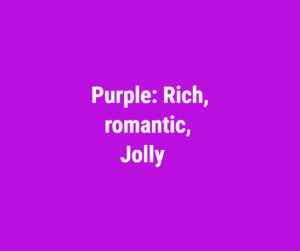 Sheen and lighting have a direct connection. As mentioned earlier the higher sheen will reflect more light and lower sheen will absorb it. 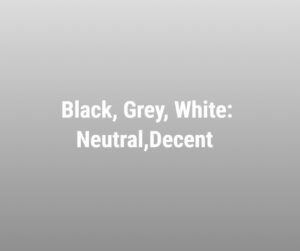 It depends on the theme you want either darker or brighter. If you want some of the features of mouldings and trims highlighted, you can choose high sheen paint with a low sheen paint in background. This will also help to make spaces look bigger. If you are not happy with standard sheen available in market, you can have custom made sheen with a mixture of two different sheen levels. What kind of sheen to choose for exterior paint? The fundamentals explained above applies to both interior and exterior painting. You need tougher paint to withstand weathering effects and obviously high gloss are the most appropriate. At the same time, you need to hide imperfections on exterior elements which are very common!! In this situation satin is the best choice. For doors, shutters, gutters and trims use semi gloss or high gloss and for sidings and any other kind of wall panels, use satin or flat. High gloss is usually not chosen for any exterior uses. 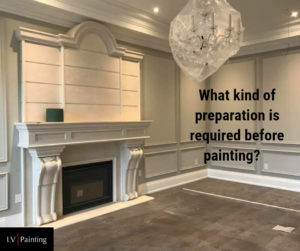 What kind of preparation is required before painting? Repainting old walls or painting new walls– both require a little different preparation. With old walls, you may avoid priming in some cases and even a single coat of paint may work if you are painting with the same color. At the same time, old walls may require more work in terms of filling gaps and cracks or removing peeled off paint or loose particles. New walls require priming and two coats to get a nicer finish and look but less headaches due to absence of cracks and holes. This topic here will not cover much about how to prepare your walls if you are a DIY painter, but the purpose is to make you aware about what your painter can do or what you can expect from the painter in terms of preparation. In general, you must 1. have a smooth surface before applying the paint 2. Make surface free from cracks and gaps and 3. ensure even absorption and high adherence of final coat to surface. To have a smooth surface all over, it must be wiped with a damp cloth or even washed properly. The painter needs to inspect the wall then after. This inspection is for gaps, holes, cracks or any loose items popping out from the wall or surface being painted. To have a smooth surface, you should get rid of all of them – either gaps and cracks or loose materials popping out. Sanding the surface will ensure removal of loose particles and achieving evenly smooth surface. For gaps and cracks, you need fillers. Some more sanding may be required after filling up holes and gaps. It is very important to ensure the use of right filler. One single filler may not fulfill all your needs! You may need to use non-shrink or flexible fillers at places with big gaps and cracks as they may expand or contract and the filler needs to withstand that movement. Priming the walls will help maintain even absorption and provide more stronger bond to the final coat of paint. It will also save some money by reducing the need of multiple coats of costlier paint! We don’t need to go in to detail on what does even absorption mean but it simply means that a primed wall will not reflect spots with different shades. 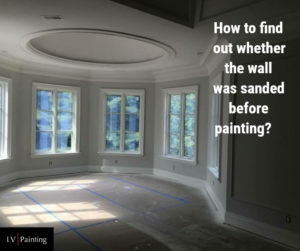 How to find out whether the wall was sanded before painting? You can do a quick test to find this out. Rub your hand on the wall surface you want to test and take a closer look sideways on it. If you can see and feel little nubs, blemishes or hairs, you can say for sure that the wall was not sanded. Do I need to prime walls before painting? In most cases, the answer is YES. Almost all the major paint brands will advise you to apply primer in all cases unless you are using all in one paint and primer product. Will you be OK to have different shades of the same color paint on your wall? Or do you need just OK kind of bonding of the paint to your walls? 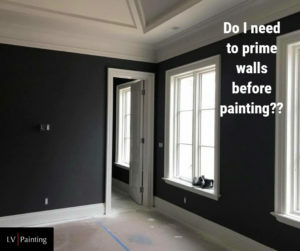 If your answer is yes, then you can avoid priming!! Any new drywall or wood surface will be porous. The pores if not sealed, will absorb the water in the paint at a faster rate which is undesired and will weaken ultimate bonding. While you prime the new surface, the special mix of the primer will seal the pores and ensure even spread of paint on top and a stronger bond. If you have a glossy paint already on wall and you want to paint on top of it, you should prime that surface. Any glossy surface/ paint will not let anything to stick not even a new coat of paint. In such cases you should prime that surface. If you are changing the color from dark to light or one dark color to another dark, you must prime the walls. From making it dark to light, you can apply white primer coats. While going from light to dark, you can get tinted primer to match the final color. You may not need a primer if you are repainting with same color and your walls are in a good condition. Overall, priming is necessary but not mandatory.